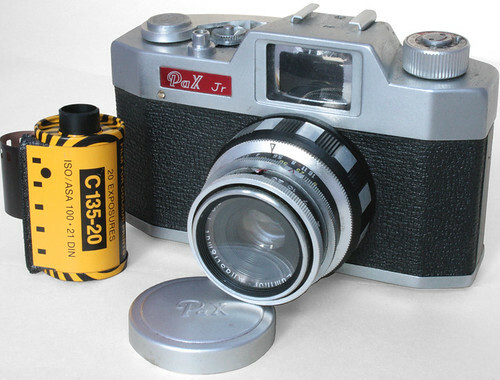 The Pax Jr or Pax Junior is a small 35mm viewfinder camera made in Japan by Yamato Kōki Kōgyō in the 1960s. It was also sold as the Pal Jr, Hilka, Barclay and, by Sears as the Tower 55B. 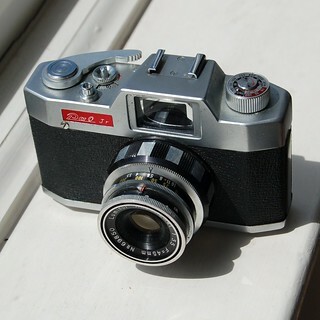 Lens: Luminor Anastigmat, Color Luna, or Yamanon 45mm/f3.5. Shutter: Rim-set leaf shutter 1/25-1/300 + B, cocked by film advance; synchronized with PC socket on the lens tube. 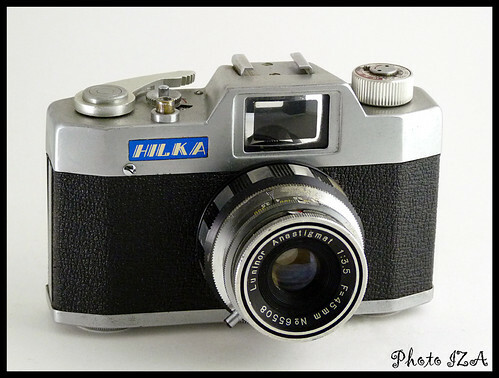 Viewfinder: Large, enclosed Albada viewfinder. Rewind: McKeown (p. 1022) shows variants with a rewind knob and with a folding crank as on the M4, and notes that this change required a new top housing profile. The rewind knob, where present, has a film-type reminder dial, as pictured. Rewind button is by the shutter release. Cold shoe on the top housing. Shutter release threaded for a cable release. A Pal Jr was offered for sale at an online auction site with a box printed with Nihon Photo Electric Co. Ltd. on the bottom half (other examples have been seen with the box printed Yamato Koki Kogyo Co. Ltd in the same place). This seems to suggest the Yamato company may have been sold, or may just have let Nihon Photo Electric market this model under their own name. ↑ Pal Jr (with low lens serial no. 1128, Luminor Anastigmat, and rewind knob) sold with box marked for Nihon Photo Electric Co., offered for sale as Ebay item 371632683229, May 2016. ↑ Pal Jr and Pax Jr, with the box for the Pal Jr, printed for Yamato Koki Kogyo Co., at Japanese blog CLACamera. This page was last edited on 8 July 2016, at 17:14.